Well, hello everyone! I've been completely MIA over the Thanksgiving season. I've been in a frantic rush to get everything done because Christmas is only two weeks away. I've been ordering gifts, wrapping gifts, decorating, planning, etc. and then my husband nicely reminded me that Christmas is three weeks away! Whew! You have no idea how relieved I was. I'm so excited for Christmas but I'm not gonna lie - I'm a bit sad Thanksgiving is over. I loved taking a whole month to intentionally thank God for all of our blessings. I hope I can continue that more through the year rather than one month. It makes life much more positive. 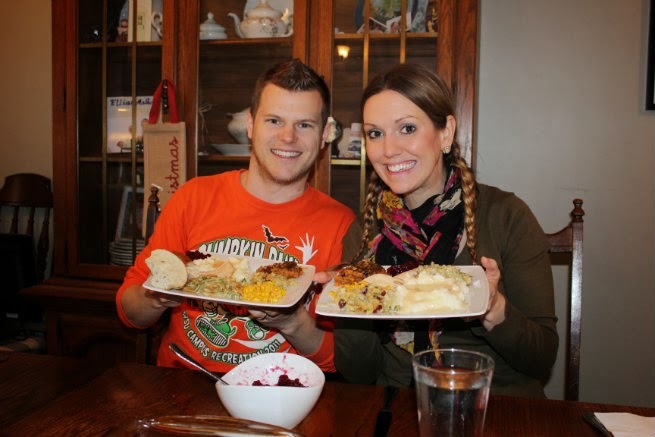 Here is a little Thanksgiving recap - Dave and I had our first Thanksgiving being married. whoop! whoop! I made my first pie ever. A blueberry one to be exact. I chose blueberry because I don't really like pumpkin (don't hate me all you PSL and pumpkin lovers) and it sounded so delicious. I researched for recipes and picked this one because the writer said she had tried many times to make pies and after all of those attempts this pie won an award. I figured it couldn't go too terribly wrong. It was pretty good and making pies isn't as hard as it sounds. Dave and I got to spend some extra time with his family. I was especially thankful for this because they often have to work when we visit on the weekends and we don't get to see them enough. This picture here was taken right before I made my husband and sister-in-law go on a carriage / wagon ride with me. I thought it would be exciting and had always wanted to ride on a carriage. However, they drove us through a parking lot while we inhaled whiffs of horse manure. =) Not exactly what I had in mind but we had a good time. 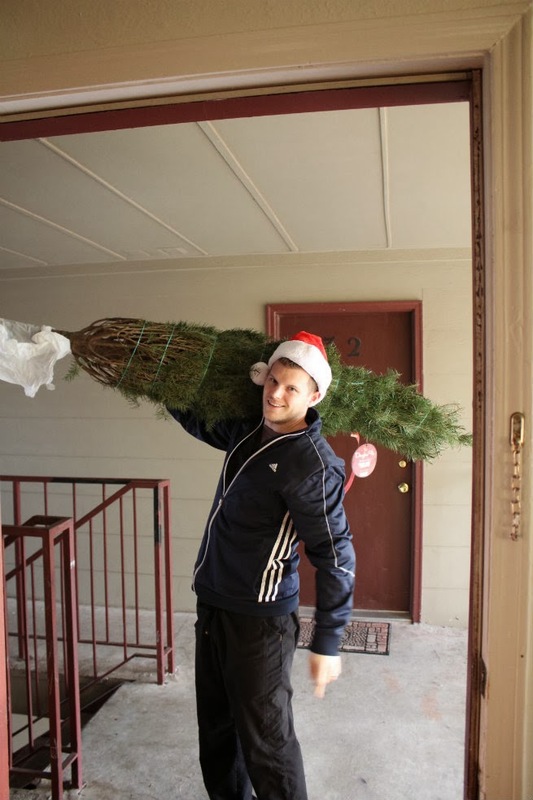 After the holiday weekend, Dave and I came back to our nice quiet town and we got our Christmas tree! Dave especially loves when I say "Wait! I gotta get a picture." 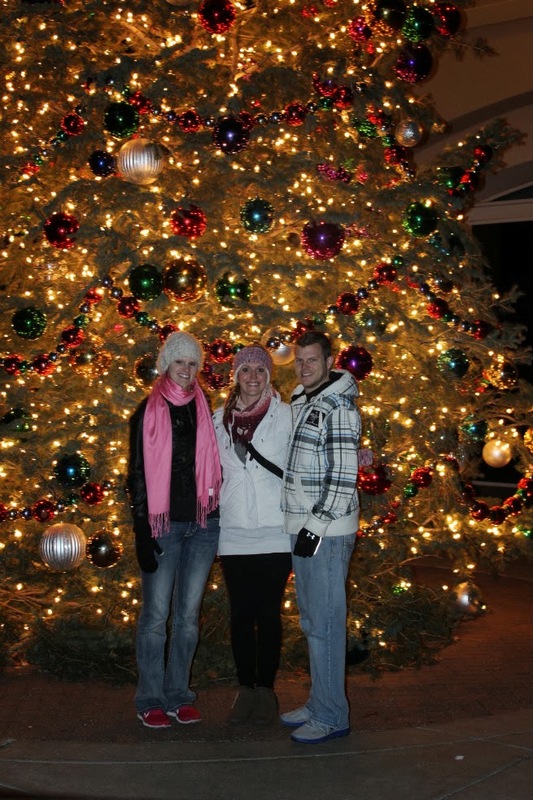 =) I don't have a picture of our tree all decorated .. yet but I will have one soon and I'll be sure to share. How was your Thanksgiving? Do you have your tree up? I hope the holiday season is everything you hoped for! that blueberry pie looks delicious! :) what fun! That picture of Dave with the tree is so cute!